Like all parks in the Six Flags chain, Great America is mostly about thrills. And by thrills, we mean the kind that are delivered by its arsenal of roller coasters. There are towering coasters—and the legions of screams they elicit—from one end of the park to the other. But not all thrill machines are created equal. If you will be heading to Six Flags Great America, you’ll want to know which rides merit your screams. To help you plan your day, we’ve pulled together a list of the park’s 12 best rides. And by best rides, we mean best coasters (with one exception). Sure, there are plenty of other things to do, including spinning rides, the nicely appointed Hurricane Harbor water park, shows, rides for little kids, and water rides. But the coasters are the marquee attractions. Let’s run down the best rides, starting with one that hasn’t opened yet (at least not when we wrote this), but is likely destined for greatness: Maxx Force. Scheduled to open in spring 2019, the wild thrill machine will break three records. Six Flags says that it will have the fastest launch of any coaster in North America. Maxx Force won’t register the fastest speed (although it will be blindingly fast), but it will reach its top speed in record time. Using a compressed air launch, it will go from 0 to 78 mph in less than two seconds. Yowza! For one of its elements, it will send passengers upside down while hurtling along at 60 mph. That will make it the fastest inversion on any coaster anywhere. And at 175 feet, Maxx Force will deliver the tallest double-inversion of any coaster. There is no way to know how the ride will actually shake out until it opens, but we suspect that it will fall just below Great America’s best ride (in our opinion), Goliath. When it opened in 2014, Six Flags billed Goliath as the world’s tallest, fastest, and steepest wooden roller coaster. It’s all true—except Goliath is unlike most wooden coasters (such as Great America’s own Viper and American Eagle). It uses a modified steel “Topper” track that completely covers the stacks of wood along its track. The innovative track allows the coaster to include inversions and deliver a largely smooth ride (two things not generally associated with woodies). Goliath is so good, we added it to oiur list of North America’s top 10 best wooden coasters. Read TripSavvy’s full review of Goliath at Six Flags Great America. Goliath is one of the top 10 fastest wooden roller coasters. Coming in just a bit behind Goliath is this wonderful wing coaster, in which the seats are placed on either side of the track or the “wings” of the train. There are a few similar rides now, but when X-Flight debuted at Six Flags Great America in 2012, it was the first of its kind in the U.S. The ride is quite smooth. While it provides virtually no negative-G-force airtime, X-Flight pours on the positive Gs. In fact, the positive Gs crushed our over-the-shoulder restraint so much, they ratcheted them down another notch and made the rest of the ride quite snug. Wing coasters are gimmicky, but X-Flight is heck of a lot of fun. Like most wing rides, the layout includes a “keyhole,” a narrow opening placed along the course through with the extra-wide trains pass. Made to look like a tall, thin air traffic control tower, the trains race toward it as if hellbent on a collision. At the last possible moment, the train rotates 90 degrees and barely squeezes through the slit in the tower. It’s a hoot. The only non-coaster ride on the list, Justice League: Battle for Metropolis is a sophisticated 3D dark ride that is on par with some of the best Disney and Universal rides. Like Universal's Spider-Man ride, it features roving motion base vehicles that move in sync with projected action. Unlike Universal's ride, it also includes blasters and interactive game play. There are multiple Justice League rides at Six Flags parks. Read our review of the attraction. There are similar rides at other parks, including Cedar Point. They are all mighty beasts. Unlike more traditional coasters, Vertical Velocity foregoes a lift hill and uses magnetic motors to launch and propel it. As a shuttle coaster, it races forwards and backwards on a disconnected track. The 28-passenger train screams forward out of the station up one tower of the U-shaped track. Vertical Velocity hangs for a few moments, releases backwards through the station (creating a wicked burst of wind for guests near the front of the line), and gets a second dose of magnetically induced booster power to propel it even higher up the second tower, which includes a spiral. When riders stop at the top of the second tower, they face 90 degrees down and experience a nice pop of airtime while they hang suspended. The cycle repeats a couple more times before slowing and stopping. It’s another gimmicky ride, but it offers intense bursts of adrenaline-pumping thrills. Vertical Velocity is not for the faint-hearted. Note that because it is a shuttle coaster and uses one train (and is in high demand as one of the park’s featured rides), Vertical Velocity often has long lines. If you are facing long lines at Six Flags you may want to consider purchasing its premium line management add-on. Read more in our article, "Six Flags Flash Pass - Is Skipping Lines Worth the Cost?" Another gimmicky, but fun ride, the seats on Superman: Ultimate Flight tilt forward 90 degrees so that passengers are facing the ground before they leave the station. This positions riders in “flying” mode. As the trains maneuver through loops and other inversions, they can stretch their arms out superhero-style to fly through the air. Read more in my review of the essentially identical Superman: Ultimate Flight at Six Flags Great Adventure. There are a bunch of identical coasters at other parks, most of which are also called Batman: The Ride. 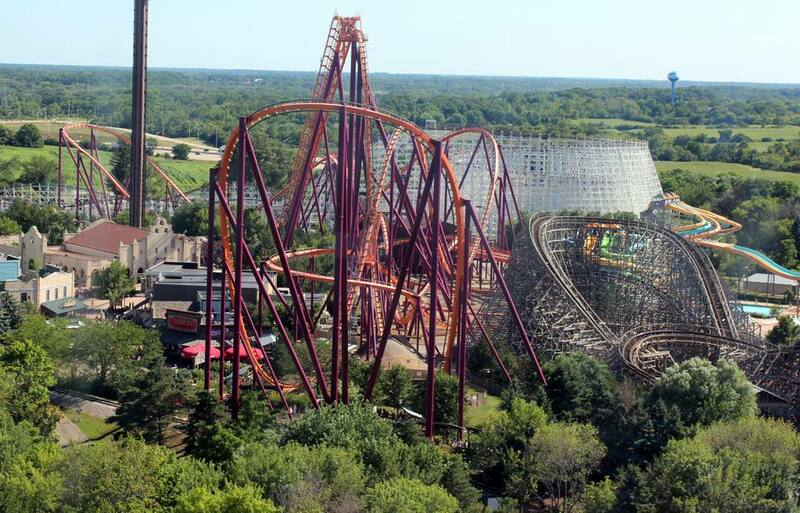 But the first one debuted at Six Flags Great America in 1992. It is also the world's first inverted coaster in which the trains hang beneath the track. It’s not particularly tall or fast compared to other behemoths. But, with its tight inversions, including a signature teardrop-shaped loop, Batman imparts bone-crunching positive G-forces. The Joker is a "4D Free-Fly" coaster. Its seats sit on either side of the track (like the “wing” coaster, X-Flight) and randomly spin forwards and backwards (in the “fourth dimension”) as the train runs along a zig-zagging ribbon of track. The ride is similar to other coasters at other Six Flags parks, all of which offer especially disorienting ride experiences. Oh how we wanted to love Raging Bull. Manufactured by Bolliger & Mabillard, the Swiss makers of incredible hypercoasters such as Nitro and Apollo's Chariot (which we consider to be among the top 10 best steel roller coasters in North America), we had high hopes. Oh how disappointed we were. After clicking up the long lift hill, Raging Bull delivered a wonderful 208-foot first drop. Raging into the first hill following the drop, a trim brake (the bane of coaster fans) sucked all the life out of the ride. Instead of soaring up for an expected huge pop of airtime, there was…nothing. What is the sense of having a hypercoaster, which is designed for speed and airtime, and neutering it? The trim brakes slowed it down and prevented any negative-G moments. That’s, um, bull. The rest of the ride, while smooth, was also lacking any airtime. To be fair, our first ride was in the back of the train. When we re-rode it in the second row, there were some minor out-of-seat moments, but nothing like the major-league, gravity-defying, mind-blowing airtime that coasters such as Apollo's Chariot provide. Hey, Six Flags and B&M: Do what needs to be done to remove the trim brakes and restore Raging Bull to its intended glory. This rare coaster uses an electric spiral lift to power the train up to the top of the track. The fairly tame ride has a gentle first drop. It features plenty of banked helices, but no inversions. The old-school coaster is among the original rides that debuted on the park’s opening day in 1976. It’s plenty of fun and great for younger kids. Originally opened in 1950 at Illinois’ (now defunct) KIddieland, Six Flags Great America rescued and moved Little Dipper to its park in 2010. The delightful little ride is considered a kiddie coaster, but this is no impersonal, off-the-shelf dragon coaster. It is a custom-designed ride with a figure-eight layout that reeks of nostalgia. The 50s-style lettering of the ride’s logo and the white lattice structure transports passengers back to post-WWII America. It’s a great gateway coaster for young children. Ride manufacturer: Philadelphia Toboggan Coasters, Inc.
Viper is another Great America coaster for which we had great expectations before we visited the park. It has a good reputation, and some coaster fans consider it among the best woodies. At one time, it may have been an exemplary ride, but sadly, not when we gave it a go. It was excessively rough (although not painfully rough like another Great America coaster that has not aged well, American Eagle) and offered little in the way of airtime. Modeled after Coney Island’s legendary Cyclone, Viper has all of that ride’s gritty brutality with none of its charm.